Diary of a Boy Genius is Cody Greer's story. Cody is both a nerd and a jock; both charming and awkward. These first three novels are the coming of age of a middle school boy. 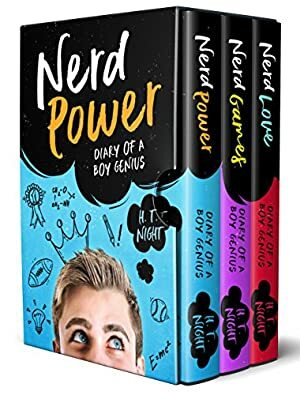 Boxed set of the FIRST THREE novels in the heartwarming, romantic and endearing "Diary of a Boy Genius" series. First loves have never been so touching... or funny. Cody has made it. He's finally in the sixth grade and king of the world. Or, at least, king of his school. Cody has a lot going for him but has only one thing on his mind - winning the heart of the new girl in school, Sarah Davis. But who knew that the sixth grade could be so much work? Almost immediately, Cody defends Sarah's honor, plays his arch-rival, Eric Mullen, in the championship football game and still manages to somehow find time to be the lead in the school play. And as he navigates through the treacherous waters of his final year at Wenchester Elementary - as he experiences his first love, his first kiss, a painful loss, and more fun and laughs and tears than he ever bargained for - Cody Greer will discover the true meaning of friendship and learn that life has a funny way of throwing you a few curve balls. Luckily, Cody Greer knows just how to keep his eye on the ball. Cody isn't like the other boys. For one, he has a very high emotional IQ. In fact, he's particularly sensitive and romantic, especially for a middle-schooler. And the object of his affection is Sarah Davis. In NERD GAMES, Cody gets the starting job as the quarterback on his school's football team and soon discovers that it's a position that he excels at. A beautiful eighth-grade girl name Michelle shows interest in Cody, and as he tries to sort out his feelings for both Michelle and his girlfriend, Sarah, his life couldn't get more complicated. Or so he thought. Will Cody make the biggest mistake of his life? Thirteen-year-old Cody tries to work things out with Sarah, the love of his young life. But he's starting to feel overwhelmed with school activities, other girls in hot pursuit, and his nemesis, Anthony, who vies for Sarah's affections. Everything seems like it might be recoverable with Sarah until Cody has a meltdown at school and realizes the source of his biggest problem. Will Sarah and Cody even go to the Valentine's Day dance together? A Sadie Hawkins event, it's up to Sarah to ask Cody. As the day draws closer, Cody waits to find out Sarah's decision and set the path for their future. Or lose his way forever. We started tracking this book on January 9, 2013. The price of this book has changed 66 times in the past 2,295 days. The current price of this book is $3.33 last checked 18 hours ago. This lowest price this book has been offered at in the past 90 days is $1.99. The lowest price to date was FREE last reached on June 12, 2018. This book has been FREE 15 times since we started tracking it. The highest price to date was $8.99 last reached on December 31, 2016. This book has been $8.99 2 times since we started tracking it. We last verified the price of this book about 18 hours ago. At that time, the price was $3.33. This price is subject to change. The price displayed on the Amazon.com website at the time of purchase is the price you will pay for this book. Please confirm the price before making any purchases.